The high price of skiing and snowboarding has lead many people to seek out a local or online discount ski equipment outlet. While the low prices may sound appealing, there are some important guidelines that should be followed. The ski, snowboard or boot received stellar reviews. The discount ski equipment outlet is offering a great price on the product. Should you jump on the deal? Not so fast! There is often a distinct disconnect between the equipment review and the skier's or snowboarders satisfaction with the product. That's why equipment stores allow people to demo. Even if you don't intend to purchase the equipment at the actual store, you should still demo it for a day. If you are trying to decide between two different snowboards or pairs of skis, demo them both on one day. Keep in mind, the price of the demo will be deducted from the purchase price. In some cases, this may end up being cheaper than the price offered by the discount ski equipment outlet, especially if you factor in shipping and handling. Ski and snowboard boots are a different story because most stores will not let you demo them. You should, however, try them on at the store and walk around in them for at least 10 minutes. If you plan to buy both skis or snowboards and ski or snowboard boots at the same equipment store, the price may be lower than what you would pay at a discount equipment outlet. Some ski resorts offer season pass holders substantial discounts at their on-mountain equipment shops. At the end of the season, they might also sell their demo models at an excellent price. With so many discount equipment outlets in cyberspace, it's hard to decide which is the best. Before you buy, check the reputation of the discount outlet with friends or on ski message forums. You will also want to check the outlet's return policy, as well as its shipping fees, and the amount of time it will take to receive your equipment. Some discount outlets charge a standard fee, while others charge by distance. In the case of the latter, avoid choosing an outlet that is too far from your home. On the other hand, if you choose a discount equipment outlet in your home state, you will have to pay tax on the equipment. 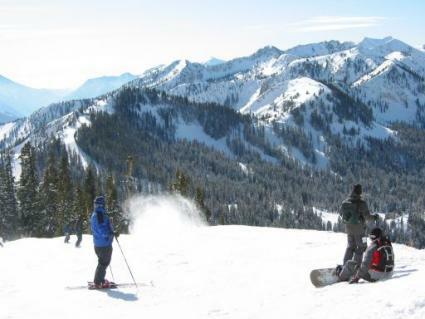 If you're lucky enough to live in Colorado, or if you have friends who live there, you may be able to participate in SNIAGRAB, an annual discount ski and snowboard event. The word SNIAGRAB is "bargains" spelled backwards. The tradition dates back to 1954 by the Colorado Sports Authority. SNIAGRAB usually takes place in September at Sports Authority stores throughout Colorado. Since Sports Authority is already a discount outlet, the 70 percent discounts offered at SNIAGRAB offer impressive savings.